On most exercise equipment designed to strengthen the legs, a simple back and forth motion on a pivot can cause stress in various muscles and ligaments, especially in and around the knee. Juliu Horvath designed the Leg Extension Unit so that, as one flexes the quadriceps while performing one of the key leg exercises on the apparatus, an additional mechanism allows the leg to naturally move outward, away from the body, providing a more gentle, fluid environment in which the leg can move. 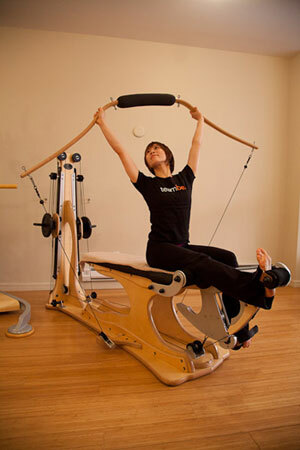 In addition, over 30 unique exercises can also be performed, using the hand/foot straps and various accessories. For personal or professional use; Certified Gyrotonic Trainers need to complete the Leg Extension Unit Foundation Course to become licensed to teach clients professionally on this machine.